Concord, NH The New Hampshire Department of Environmental Services and the New Hampshire Sustainable Lodging and Restaurant Program (NHSLRP) announce that the Mountain View Grand Resort and Spa in Whitefield, N.H., has been certified as an Environmental Champion, the highest level of certification in the sustainability program. It achieved this by implementing multiple projects that reduce waste as well as conserve energy and water. The certification process involves completing a points-based application that scores facilities on their environmental initiatives with a third party inspection and verification. 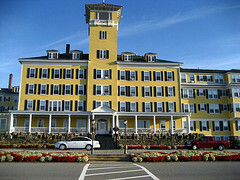 The Mountain View Grand is one of four remaining grand hotels in New Hampshire and has been in operation since the late 1800s. The resorts owners and staff are committed to becoming models for environmental responsibility. The Mountain View Grand has earned recognition as a 100 percent Green Power Purchaser as part of the U.S. Environmental Protection Agencys Green Power Partnership program. In 2009, a 121- foot, power-generating wind turbine was installed adjacent to the hotel. To supplement the turbine energy, the owners purchase Renewable Energy Certificates to certify the resort as 100 percent wind-powered. From September 2009 to March 2010, the combination of these two sources avoided close to 400,000 pounds of carbon dioxide emissions or the equivalent of the greenhouse gas emissions from 33 passenger vehicles each year. The wind turbine is just one of the many environmental projects that the Mountain View Grand has undertaken. The owners replaced over 75 percent of its light fixtures with compact fluorescent lighting and implemented a comprehensive recycling program. They turn spent cooking oil into diesel fuel that is used by a local construction company, and for room and hallway insulation, they installed Green Fiber insulation made from 85 percent recycled paper. There is a working farm on the property, which is used as an educational tool as well as providing the kitchen staff with fresh eggs and vegetables when available. The Mountain View Farm is home to several rare breeds, such as the Leicester long-wool sheep, whose wool is sheared, spun and available for purchase. The resort supports local farms and businesses whenever possible and the owners and staff are environmental stewards for the 1,700 acres the Mountain View Grand maintains. The landscaping consists mostly of native perennials that require less water and the resort has its own water tower that provides irrigation to the golf course and resort grounds. The Mountain View Grand is planning to implement more sustainable projects in the future, such as a comprehensive composting program and a switch to bio-diesel fuel for its building heating system. Environmental responsibility is woven into everything it does and it shares all of this with its guests by offering daily tours highlighting all of the sustainability efforts that are not as obvious as the wind turbine. The Mountain View Grand was chosen as the site of the next meeting of the Environmental Council of the States, a national organization comprised of the heads of state environmental agencies. The meeting will take place in late August and provide an opportunity for the resort to further showcase their environmental initiatives.